I finally found the perfect pair of Rubik’s Cube earrings! They were big, bold, and literally cried out my name. When I found them, my heart pounded from the excitement and relief. I was so proud that my earring adventure led me to discover a really unique brand! These beautiful Rubik’s Cube earrings were handmade by Olivia Moore, owner and earring designer for HypnoEars. One fun fact about HypnoEars is that all earrings are made with yarn and a plastic canvas. Yeah, I’m sure it sounds simple, but it’s not. It takes great talent and a lot of time to create such amazing designs by hand. Check out more of HypnoEars cool earring designs at their online shop! Here’s the reason for it all! This colorful and fun Rubik’s Cube crossbody handbag initiated my creative juices. It may look small by picture, but it’s actually pretty roomy! Also, it has the power to add a pop of fun to any of your casual looks. 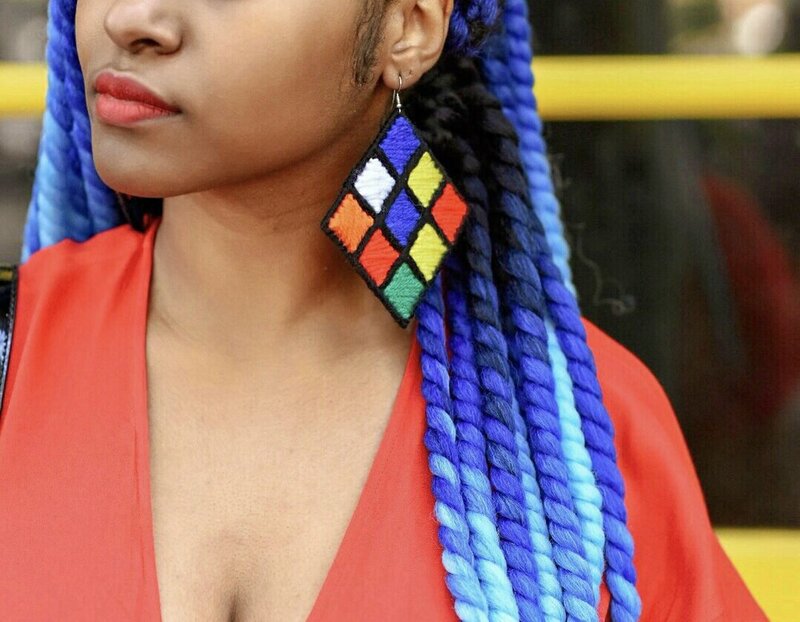 If you purchase The Rubik’s Cube earrings, make sure to tag me on social media @rinniepstyles so I can see how you rock them! Comment your thoughts on today’s look. Feel free to share and subscribe. Don’t forget to style your fullest :) Thanks for reading!